It is always a pleasure and a surprise to look back over the past year and remind ourselves of our many accomplishments for Puna. Although 2008 will be known in the annals of history as a “bad year” on the national and international levels, here in Puna we have moved forward in many positive and proactive ways. I hope that as you read over this newsletter you will realize that we really can make a big difference if we put forth the energy and determination. Malama O Puna is committed to doing just that, and we invite your new and continued support. Please fill out the membership application at the end of this report and send it in with your dues and, we hope, a generous donation. This will be one of the most cost-effective things you can do to help your community – e komo mai! Botanist David Paul, who also heads up the Big Island Native Plant Society, is our Arboretum Director, and has launched a massive propagation program, sowing seeds at his Kurtistown nursery for out planting later on. Brian Jordan and Kaniu Kinimaka-Stocksdale are helping us find a way to build the combination office, environmental library and education center at the corner of Kona and Hapu‘u Streets in Nanawale – this will be a challenge since we are so very low budget. Our column in the Puna News has been running every month for over five years, providing Puna with action alerts, resources, how-to tips, notice of events and all sorts of relevant information. This past year we covered issues such as the proposed 30 meter telescope on Mauna Kea, the Interior Department’s proposal to take the ‘Io off the Endangered Species List, GMOs, how Hawaiian Rights benefit everyone, the Puna Sustainability Expo, the Puna Community Development Plan and many other topics. If you missed any of these, check out our website. We are grateful to Denni Temple, the publisher, for giving us the space so we can outreach to you. Our secretary, Sherry Kelso-Palmer is our webmistress and has created a beautiful site for us, with, as you might expect, lots of natural beauty. You can find out about our many projects, read back Caring for our Land articles you may have missed, and link to other environmental groups and websites. The site gets updated periodically, as Sherry’s lifestyle allows. You can also join or renew your membership or make a donation using the site. We partnered with Aha Kanaka (the Kanaka Council) to put on this first-ever event at the old maile packing shed in Pāhoa on November 1 and 2. The event featured demonstrations, information booths, lectures and workshops on sustainability of food/agriculture, energy, transportation, medicine, waste disposal/recycling, shelter, water and traditional cultural solutions – not high end expensive solutions, but D-I-Y projects for low budget residents that work just fine, thank you. We had so many positive responses that it demonstrated to us how much this sort of event was needed; so we decided to have two expos in 2009. Mark your calendars for May 9th and November 14th. Mainstreet Pāhoa Assn. has generously offered to cover the liability insurance for both events, and our blue knights will direct traffic so that we don’t jam up Pāhoa Village Rd. Pāhoa Weed & Seed will pay for the posters. Mahalo kakou! We attended three fairs and did outreach to the attendees: two of them were sponsored by Councilwoman Emily Naeole. The third was at Kalani Honua, and was entitled “EarthDance”. Not only did we have a display table there, but René made an oral presentation. Some new members joined our ranks. Although our nonprofit status does not allow us to endorse candidates per se, we held our first ever candidate forum for County Council candidates, and all the questions were on the environmental issues facing Puna. The candidates did not see the questions ahead of time, so the audience could readily tell who knew their stuff and who was fudging. The large rec room at the Pāhoa Neighborhood Facility was filled to capacity, and the event was videotaped for the public access channel. Many residents expressed their gratitude and requested that for the next election year we consider holding forums for other offices as well, such as State rep and senate seats. In addition to the above, we emailed our members the new rules just promulgated for the Northwest Hawaiian Islands. If you did not receive these, it could be that we do not have a current email address for you, so please remember to let us know if/when you change your contact info. We also shared information about the Neuton mower which is lightweight and can run on a 15# battery rechargeable from your solar system – no noise, no fumes, no gas and totally sustainable. And at our annual general membership our vice-president Ann Kobsa and our education chair Mitzi Messick gave a powerpoint presentation on the Wai ‘Opae Coral Reef Restoration Project which they also showed at a conference in Honolulu. With grants from the Hawai’i Tourism Authority’s Natural Resources Grant Program and the U.S. Fish & Wildlife Service we have been eradicating red mangrove in the Kapoho tide pools area, with a great degree of success. Mangrove can change the water chemistry, turn a coral reef into a swamp, and change the native fish nursery into habitat for alien marine fauna. We are now moving from our original site to other areas that are serving as a seed source and soliciting the cooperation of those property owners. Our team, under Vice President and Invasive Species Coordinator Ann Kobsa, has also been making monthly forays into the Nanawale Forest Reserve all year, and each time there are fewer and fewer, so we must be doing something right! Many of the vireya rhododendrons and palms that we planted were vandalized and/or stolen, and we have continued to replace them in hope that the miscreants will get bored and eventually leave them alone to flourish. This project was off to a slow start, due to a lot of OHA red tape, delayed receipt of project funding and a wait for the DLNR permit. We are now ready to roll and are looking for volunteers and school groups to protect our unique rainforest. Any takers? 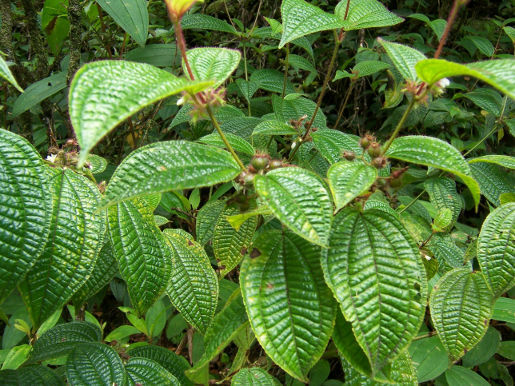 The photo at right is one of the culprits: Clidemia hirta, whose very appropriate common name is Koster’s Curse. Several of our Board members and many of you were involved in the creation of this document. As a Hawai’i County Planning Commissioner, our President René Siracusa worked hard to get it passed on to Council, and then testified in support at that level. The next step is implementation, which includes crafting the changes to our laws and regulations to enable the positive changes to happen. Malama O Puna will continue to work on this. This includes changes to the Grubbing and Grading Ordinance. Back in 1993, a pseudo-environmental group, heavily funded by Exxon Corp., and with an agenda to dismantle the Endangered Species Act one species at a time, submitted a proposal to the Interior Department to remove the ‘io from protection. The group has since dissolved, but the department’s rules force it to continue the de-listing process. The only evidence the rules allow is published biological studies – no cultural relevance (aumakua) or lay observations. We do not believe that the ‘io population has recovered to the extent that warrants removal from the list. Lava flows, wildfire, storm damage and rampant development have greatly reduced the number of large ‘ohia that the ‘io need to nest, mate, roost and fledge. We testified in writing and in person already and will do so again at public hearings. We have also submitted testimony in opposition to the proposed 30 meter telescope on Mauna Kea. A comprehensive management plan for the mountain has been promised for many years, but development, degradation and abuse have continued without a plan’s guidelines. The astronomy consortiums have not paid a fair market rent on this prime real estate which could benefit native Hawaiians (it’s ceded land) or the larger community. All the alleged benefits to the community have been promised in the past by the other observatories, and for the most part we have not seen them implemented. Trust is therefore in short supply. Our UH and some of its researchers get large grant awards from companies like Monsanto to do transgenic studies and field testing. Farmers of taro (kalo) and Kona coffee have asked that those crops be exempted from such research. The bill asking the State Legislature for a 10-year moratorium on genetic testing of these two crops was, despite massive favorable testimony from the public (including us), turned on its head to accomplish just the opposite. Fortunately it failed. The County Council then took up the matter to declare the moratorium for this island. We testified in favor and it passed. A fuller explanation of our reasoning and concerns appeared in the Puna News. If you missed it you can go to our website. We also submitted testimony to the State Legislature in support of funding for a perimeter fence to protect the Mauna Kea Forest Reserve and its endangered species from ungulate destruction of that habitat (SB2316). We supported the creation of a surcharge on incoming air freight that would fund air carrier inspections for alien invasive species (SB2404, HB2843 CD1); the per ton surcharge would not increase the cost of commodities in any appreciable way, but it would fund increased ag inspections as a proactive way to address the problem and, ultimately it would be cheaper than fighting incursions after the fact. Unfortunately, Gov. Lingle doesn’t see it this way and vetoed this bill. We also supported amendments to DLNR enforcement rules that added coquí, little fire ant and the stinging nettle caterpillar to the State DOA pest list. For six years we have helped this event bring music, fun and joy, information and economic assistance to Pāhoa on the day before Mother’s Day. This free event is also drug- and alcohol-free, and enjoyed by all. Another nonprofit will be picking up the fiscal agent work in 2009. The Vacationland Hawai’i Community Association asked us to help them get a County grant so they could hire someone to assist the visitors to the Wai ‘Opae MLCD tide pools with parking, security and environmental information. He also hands out a brochure about the tide pool ecology and how to enjoy without destroying it to those who are interested. Mainstreet Pāhoa Assn. puts on this popular annual nonsectarian event, and this year we acted as their fiscal agent so that they could access grant money. We wrote the grant proposal, handled the funds and wrote and submitted the final report to the funder. We consider this our crowning achievement of umbrella-ed items, because of the health care crisis facing the entire State, and Puna District more so than all the others. The PCMC now has its own nonprofit status, but in the beginning we agreed to act as fiscal agent so that enough funding could get the doors open to serve you and your family. The Human Resources Committee of the County Council, chaired by Emily Naeole, appropriated $170,000 ($42,500 each quarter) to kick-start the clinic. That is the grant that we are fiscal agent for. We also have been helping to write other grants and to organize fundraisers. The County Dept. of Public Works called us in to consult on native trees for the new Pohoiki Bypass. We told them which trees would be appropriate, their mature size and growth patterns and where to obtain them. And we are also planting some of our own trees there. We made a donation of 21 palms and ‘ohia to Pāhoa Elementary, for their ongoing campus beautification. We became a “certified provider” of first aid training with the American Red Cross. Mark Franklin teaches adults and our Jr. Lifesaving Program and, as a County lifeguard, has the skills and training – and the desire, to share this knowledge.